With its retractable USB connector, the Cruzer Glide USB 2.0 flash drive is made to endure the bumps and impacts of life on the road. The compact design slips easily into a pocket, so your files are accessible anywhere you go. SanDisk flash drive provides convenient, highly portable storage that lets you take your files anywhere. Get fast data transfers with USB 2.0 connectivity. SanDisk flash drive provides convenient, highly portable storage that lets you take your files anywhere. Fits easily in a shirt pocket. Holds all types of files. Get fast data transfers with USB 2.0 connectivity. Easy to use - simply plug into USB port. Store, transfer and share video, music and other files. Compatible with Windows®, Mac and Linux computers. The reliable Cruzer Glide™ USB Flash Drive gives you the storage you need to carry and transfer your music, movies and other files. 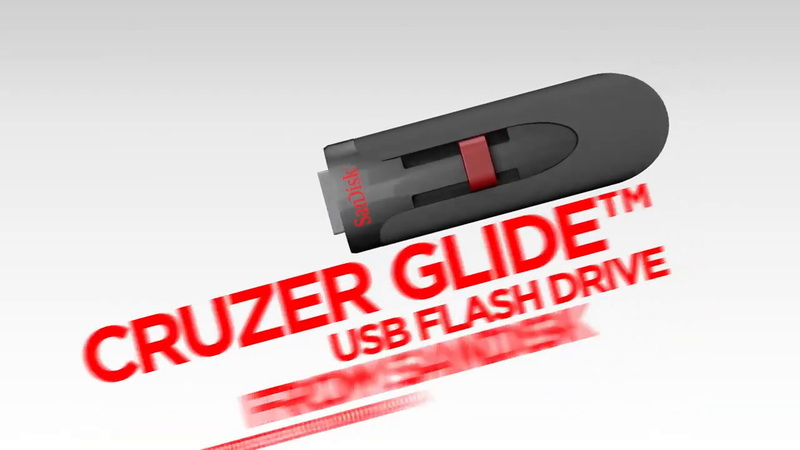 The Cruzer Glide™ USB Flash Drive features an easy-to-use retractable connector so it slides and doesn’t need a cap. Create a private folder on your drive with SanDisk® SecureAccess™ software1. This 128-bit AES encryption software makes it easy to password-protect critical files. Drag and drop files into the vault, and they'll be encrypted. SanDisk® offers a wide range of performance levels in its USB Flash Drives, each designed to meet a different range of customer needs. If the Cruzer Glide™ 2.0 USB Flash Drive doesn't offer the right solution for you, here are some alternatives for you to explore. Read speed determines how long it takes to open files from the USB, the higher the read speed, the faster large files will load on your computer. Based on internal testing; performance may be lower depending upon host device. High write speed means yours data is saved faster and more efficiently to the USB, meaning there is less waiting time. ** 32GB, 64GB, 128GB, 256GB: write to drive up to 10x faster than standard USB 2.0 drives (4MB/s); read speeds up to 100MB/s. 16GB: read speeds up to 100MB/s; write speeds lower and vary by capacity. USB 3.0 port required. Based on internal testing; performance may be lower depending on host device. 1MB = 1,000,000 bytes. © 2018 Western Digital Corporation or its affiliates. All rights reserved. SanDisk, Cruzer Glide, and SanDisk SecureAccess are registered trademarks or trademarks of Western Digital Corporation or its affiliates in the US and/or other countries. Mac and Mac OS are trademarks of Apple Inc. Windows and Windows Vista are either registered trademarks or trademarks of Microsoft Corporation in the United States and/or other countries. All other marks are the property of their respective owners.